This homemade costume for girls entered our 2017 Halloween Costume Contest. While there were costume pieces we obviously bought - the wig, the hat, the gloves - a lot was made & adapted (including those gloves & the hat). The jacket was a hand-me-down fuschia faux leather. After attaching a faux leather back flap to it and some lapels (heat transfer & glue), I lightly spray painted it with black, pastel blue, and bright teal. It worked! I bought scrap fabric for the gold sequin lapels and the underskirt. Spray painted the skirt gold. Bought fringe for shoulders & boots and spray painted lightly, ditto with gloves. The fringe skirt was made from purchased craft scrap leather, and also painted. The shirt was an old one found in a drawer made to fit, and the logos on back of jacket and shirt were drawn with paint markers. The bracelets came from my own stash, as did the belts. I added the ribbon and sea bits to the hat - secured through craft store shopping, fabric scrap we already had, and collected old shells & bracelets. Hot glue!!! 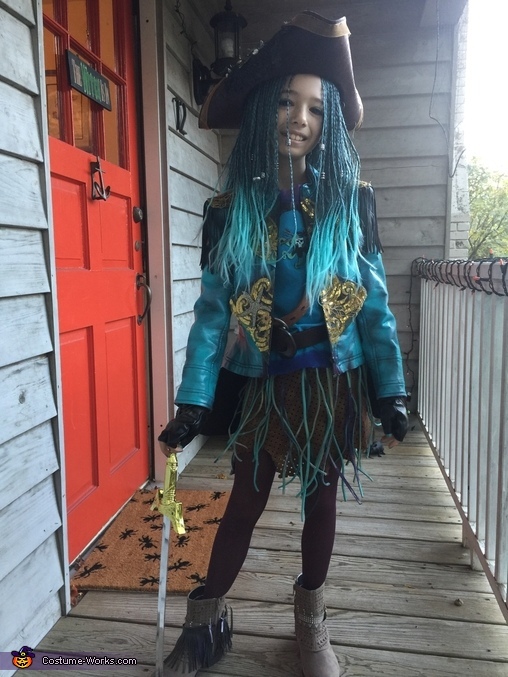 She had an ABSOLUTE blast wearing it and we, as always, loved Halloween!